Two Macron East Sussex Football League clubs are through to the semi-finals of the Sussex Bluefin Junior Cup. Division One sides Crowhurst and Sidley United booked their places in the last four of the county knockout competition with 3-1 victories away from home on Saturday. Crowhurst saw off Division Four leaders Hailsham Athletico on the 3G pitch at Eastbourne Sports Park. Jamie Lindsay put Crowhurst ahead only for Tonderia Ndoro to equalise with a terrific strike from outside the area. The Crows had a player sent-off for protesting at the non-award of a goal when Crowhurst were convinced the ball had crossed the line, but a Karl Tomlin free kick put them back in front. Lindsay made sure of Crowhurst’s victory with a firm drive which went in via the goalkeeper’s chest. Crowhurst will visit Montpelier Villa II or Wadhurst United, whose game did not survive the morning pitch inspection, in the last four. Division One pacesetters Sidley overcame Midway (1948) thanks to goals from Mark Funnell, Aaron Cochrane and Arron Scrace. The Blues’ reward is a home tie against Woodingdean Wanderers. Woodingdean came from 2-0 down to edge out East Sussex Division Three outfit Burwash 3-2 in a match which was moved to a 3G pitch in Brighton to ensure it could be played. Goals in the opening 20 minutes from Mark Pickles and Kieren Martin appeared to put Burwash in charge, but the hosts got one back before half time and struck twice more after the break to complete the turnaround. Only one league game survived the weather, and on a mudbath of a pitch, Northiam 75 beat visitors Bexhill AAC 7-1 in Division Two. 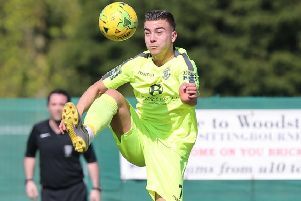 Sam Dangerfield helped himself to five goals, with Scott Embery and Oscar Garcia Cruz also netting for Northiam, who move within a point of leaders Herstmonceux. Dom Sinden scored a late consolation for AAC.